Working alongside partner club F.C. Barcelona we invited members of the local and international press, as well as some of gaming’s most influential YouTubers, to play a private football match on the legendary Camp Nou pitch. We divided the media into two teams which were captained by FC Barcelona legends, and surprise guests, Patrick Kluivert and Gaizka Mendieta. The match allowed our guests to show off their real-life football skills before we brought them inside the stadium for an exclusive PES 2018 hands-on; giving them the opportunity to experience the game then share their thoughts with their audiences ahead of its release. 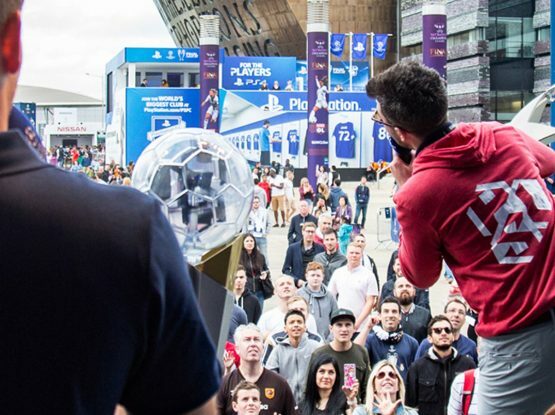 The YOUplay activation served to build media buzz for PES 2018, exposing the game to an international audience whilst celebrating PES League and FC Barcelona’s premium partnership.